Enermax’s PSU’s have rarely disappointed us, and models such as the Galaxy and Revolution have picked up more than a few awards over the years as a result. The Revolution 85+ 1.25kW has held its place in Custom PC as our choice for extreme overclocking for quite a while. 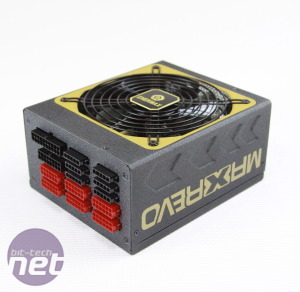 However, this month sees the return of PSU testing to bit-tech, and the Revolution 85+ series now has some competition. The Enermax MaxRevo 1350W is one of the most powerful PSUs we’ve tested, and boasts a fearsome list of specifications. It sports Enermax’s post-shutdown cooling, called HeatGuard, which keeps its own fan, your PC’s fans and even any water-cooling pumps operating for up to a minute after your PC shuts itself down to help dissipate heat. 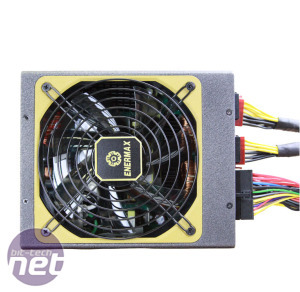 All of its power cables are modular too; while everyone will need to use the 24-pin ATX connector, it’s far easier to connect this to the PSU separately after you’ve installed it. In terms of cooling, the MaxRevo is equipped with a large 139mm Enermax Twister fan located in the base of the PSU, which is protected by a black grille. It spins at 900rpm when it starts up and tops out at 2,000rpm. This fan proved to be very quiet indeed, even at 100 per cent load. As far as cables and connectors are concerned, the MaxRevo has enough of them to power a monster of a PC. 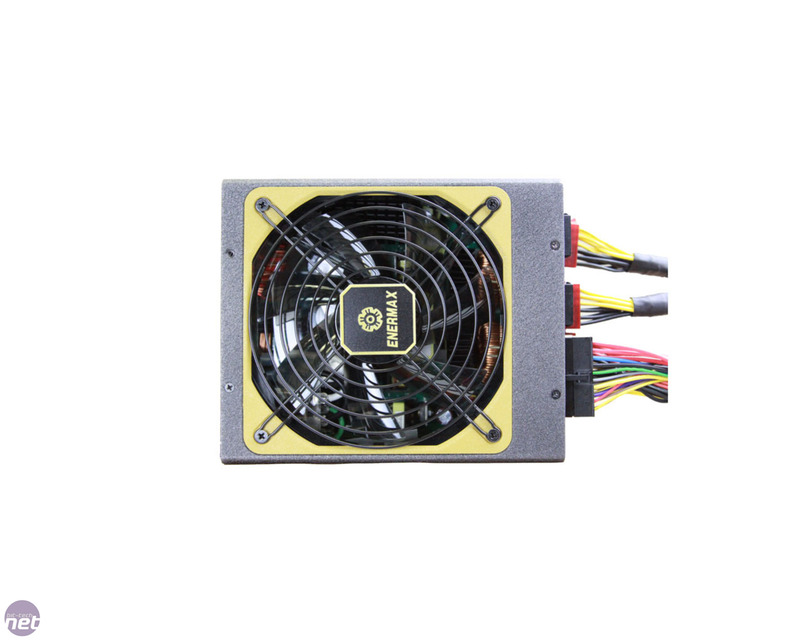 There are eight 6+2-pin PCI-E connectors, 14 SATA power connectors, ten Molex connectors, an 8-pin EPS12V connector and two 4-pin ATX12V connectors. The SATA and PCI-E connectors are also spread over eight individual cables, with the remainder spread over a further four cables (12 individual cables in total). This enables you to easily trim the amount of cables you need for your particular setup. As a result, cable tidying shouldn’t be quite as daunting as it might first appear – if you don’t need all the SATA or PCI-E power cables, you can simply leave any unnecessary cables in the box. Sadly, while all the cables are of sufficient length (even the shortest cables stretch to 50cm), they haven’t been braided particularly well. There’s a good inch of bare power cables near the connectors on most of the cables, and the 24-pin ATX connector in particular lacks any braid or heatshrink for a good 4in at either end, meaning that it looks quite unsightly. However, as you would expect, there's plenty of power on offer. The MaxRevo has six 12V rails, each of which is able to supply up to 30A with 112A available in total from the six rails. In theory, this brings the total power available from them to a staggering 1,344W, although that wouldn't leave you any room in your power budget for anything else. Meanwhile, the 3.3V and 5V rails are each able to dish out up to 25A, with 140W available between them. 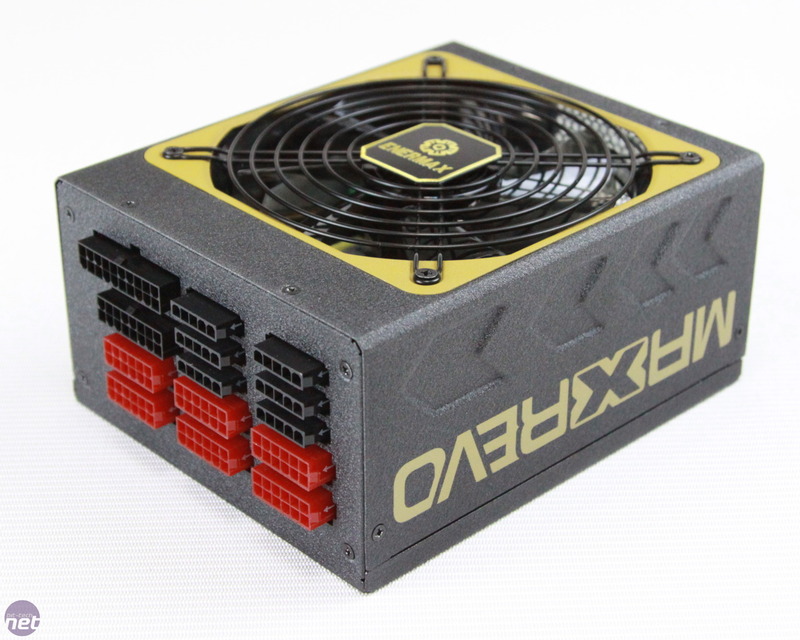 Measuring 180mm deep, the MaxRevo is also slightly larger than mid-range PSUs, which is worth bearing in mind if your case has limited clearance behind its PSU mount. It’s still much smaller than the lumbering Enermax Galaxy of old, however.